Autumn is a beautiful time of year to visit Algonquin Provincial Park in Ontario, Canada when each tree has a display of colorful leaves. Yellow Autumn leaves are the most common colors on display on the tree in the foreground while bright reds and oranges create a brighter showing of Autumn on the tree in the background. Along the Whiskey Rapids Trail in Algonquin Provincial Park in Ontario, Canada, the Autumn leaves vary in color on the different species of trees. Each type of tree has its own agenda during Autumn and sooner or later, all the leaves will have displayed their beauty and made their way to the forest floor. Brightly coloured leaves along the Whiskey Rapids Trail during fall in Algonquin Provincial Park, Ontario, Canada. 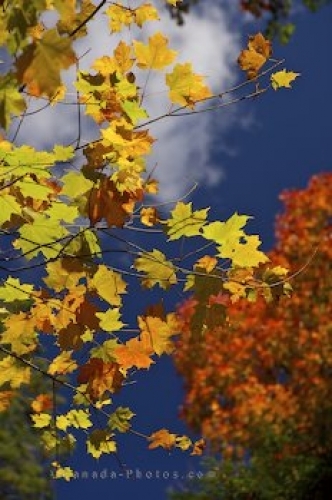 Picture of the display of Autumn tree leaves in Algonquin Provincial Park in Ontario.